KARACHI, Pakistan, Sep 6 2012 (IPS) - It will be no less than a miracle if Nadir Ali makes it to Australia, where he planned to seek asylum. But with each passing day, since his boat went missing over two months ago, hopes are dimming. Ali, a 45-year-old Shia Hazara daily wage earner from Quetta in Pakistan’s Balochistan province, had reached Indonesia and boarded the boat from Jakarta on May 22, along with 24 others, most of them from the same community. But the boat lost contact soon after it hit the high seas, and has been missing for over two months. “We were told that the sea was rough and the boat was too small,” said Qadir Nayel, Ali’s younger brother speaking to IPS over the phone from Quetta. “But because there is no news of them having drowned, we are hoping against hope.” Nayel said his brother paid over 10,000 dollars for the passage. But why are Hazaras fleeing the country? 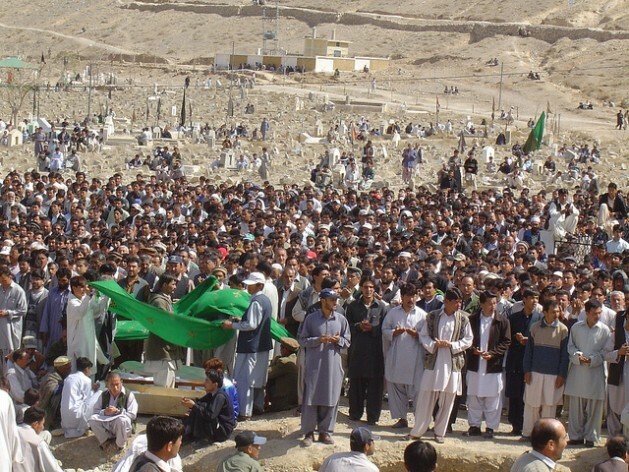 In what looks like a rerun of history, the Hazara Shias, with a population of around 956,000 (nearly 600,000 of whom live in Quetta alone), are being persecuted again in Pakistan because of their ethnicity and their history of conflict with Sunni Muslims. Most of the world’s eight to 10 million Hazara people, easily recognisable by their Mongol-like features, live in Afghanistan. But some 120 years ago, many fled that country, where they were being persecuted by the dominant Sunni Pashtun tribes. In Pakistan they were well received, and some rose to important positions in the government. Shias of all ethnicities account for about 20 percent of Pakistan’s Sunni-majority population of 180 million. Hussain (name changed on request) lost five members of his family, including a maternal uncle, a widowed sister-in-law and her three children, when the boat they were travelling in was shipwrecked in high waters in the Indian Ocean in 2009. In recent years, scores of Hazara Shias have fled Balochistan in southwest Pakistan. There are significant communities of Hazara in Europe, Turkey and Australia. While official statistics are hard to come by and people are afraid to give information, the exodus has been fuelled by the rise in target killings of members of this community. According to Abdul Khaliq, chairman of the Hazara Democratic Party, over 25,000 Hazaras have left Pakistan in the last decade, the vast majority of them in the last three years. “I’d say over 1,000 people have perished while making the perilous journey,” he told IPS over the phone from Quetta. He was referring to the most common route followed by the fleeing Hazara, who go to Indonesia legally and then try to sneak into Australia illegally. “They can only go about their daily business at the risk of their lives. It is hardly surprising that members of the Hazara community are seeking political asylum in large numbers, and it would be a very cruel host state indeed that would deny them the same,” he added. Since the beginning of the year, 47 Shia Hazaras have been killed in 21 separate incidents of violence, according to the South Asia Terrorist Portal (SATP). In 2011, 203 Shias were killed, including 27 Hazaras. HRW’s research indicates that the banned Sunni militant group Lashkar-e-Jhangvi (LeJ) is behind the killings. “It claims responsibility for these attacks,” said Hasan. To Agha it means a “total failure or collusion” of the state machinery with these militant organisations. Agha, who has been researching Hazara issues since 2010, complained that the Pakistani state has never “mounted any effective resistance” or carried out a “sustained effort to dismantle the hard-core sectarian militant outfits” that have linkages with both the religious parties and the Pakistani establishment. “Unless Islamabad abandons its policy of tolerance towards the sectarian religious parties and their militant counterparts, there is little hope that Hazara Shias will continue to live in peace within the poisoned territorial boundaries of Pakistan,” she maintained. Meanwhile, thousands of asylum-seekers from Iran, Afghanistan and Pakistan, many of whom belong to the Hazara community, have been trying to reach Christmas Island in the Indian Ocean – Australia’s closest point to Indonesia – in rickety, overcrowded vessels. Since late 2009, more than 600 people have died in the attempt to make it to the island. In August, the Australian parliament tried to make changes in its immigration policy to deter asylum-seekers by deporting them to offshore detention centres. The move met with strong criticism from rights groups. “It’s a big ocean; it’s a dangerous ocean,” said Prime Minister Julia Gillard. “We’ve seen too many people lose their lives trying to make the journey to Australia.” She had proposed sending asylum-seekers to Malaysia for processing, but the plan was rejected by Australia’s highest court. 600 people have died in the attempt to make it to the island.”—It is such a shame for the Muslims in Pakistan and in the world! People, what are doing? Why you don’t tolerate each other? Are you human being?! Dear Writer, I strongly oppose the research of South Asia Terrorist Portel (SATP) on the nubmer of Hazara killing from begining of year is not 47. I have the data with the name and location of Hazara killing, from January 2012 till date more the 100 Hazaras are killed and in 2011 more then 130 Hazaras were killed by trroriset groups. Kindly correct one thing that Hazara don’t belong to Changaz or Mangol, We Hazara has killed the﻿ grandson of Changaz by the name of Mutugen in 1221 in Bamiyan. So how you say that Hazara are descendants of Changaz. the alive example is pesent in Bamiyan that we Hazara fought with the armies of Changaz in Shara e GhalGhola or City of Screams is alive example in Bamiyan is that Hazara don’t belong to Changaz or Mangol. A particular tribe of Hazara may belong to Changaz or Mangol but not complete Hazara nation. Best creature of Buddha is Present in Hazara’s motherland which is expected 2000 years old. Monks which is present in Hazara’s motherland is more than 3500 years old, so how you can say that Hazara are descendants of Changaz!!! i just want to give you some hints that when ever you write about any nation specially when about Hazara nation so please collect some information about it, don´t write what ever you want coz you are damaging the histry of Hazara nation which is not allowed and will be not tolerated. Hazara nation do not belong to Changaz khan, it is indeed that a part of our nation is mixed with them but Hazara nation has its own history and as my brother `SABIR` mentioned in his comment its right. and the population of Hazaras in Quetta is more then that you have mentioned. As i said, collect some deaper information then it will be more comfortable for us too when we read your article in future. Dear Writer: Let me correct your weak information regarding hazara population because Hazara population has been estimated above 10 million around the world; 8 million is living in Afghanistan including 2 million which is living in Kabul city, and the rest 2 million is living in Pakistan, Iran Europe etc etc. Good article! Not sure of why ALL the underlining threats???!!!! Very stereotypical! dear stop fighting here now no one care about you histry and how old is your histry. the problems is today how to save hazaras form the enemies. it doesn,t mater how big or small nation you are. the only thing we need today we have to be one nation simpel is that . non of you knows about your histry .